As most of you already know about me, our children are grown and past "school days". So, when I think about "Back-to-School", I think about other members of our extended family and how getting back into the swing of things at school time affects them. One of those very special people in my life (yes, besides my adorable niece Alexa) is my niece, Brittany. She is number three of six children and she is a Special Education Teacher in Duluth, Minnesota. She's been busy getting her classroom ready for school to begin, and preparing for yet another crazy busy school year. I always like to send Brittany special little cards and notes to encourage her. I realize how hard teachers work. But that's not the biggest burden on Brittany's heart right now. Brittany has been working very hard, and just received her Bachelor's Degree in June. She's been dating the same guy for three years now. They had everything planned out (or so she thought) for her to get engaged this summer. In fact, they even took a trip to Europe (via Paris, France and other such romantic spots) so she was really expecting a proposal. She says they had talked about it several times. She's starting the school year......not engaged. OK....and now here's what really makes it harder. Brittany's oldest sister, Margaret, (the first of the six children in Brittany's family) has been dating her boyfriend for three months now, and.....they just got engaged. Poor Brittany. I adore this sweet girl and I just know her heart is hurting, and that she's feeling crushed. I made this card with her in mind.....and I really hope it cheers her up. Of course, I tucked a Starbucks gift card inside the kraft envelope, and I know that will make her smile. My card was created using a kraft base, a piece of navy patterned paper, a Maya Road kraft envelope with navy brads, vintage striped baker's twine, a red and ivory JilliBean Soup journalling card (family), boy/girl paper-pieced people, stamped sentiment from Paper Sweeties (Love You To Pieces) using Tim Holtz Distress Inks, a wooden heart, a Maya Road canvas tag, a piece of Tim Holtz ruler ribbon, a piece of vintage scotch tape, and two Tim Holtz rusty paper clips. I love that the Maya Road kraft envelope makes a great focal point as well as a perfect place to tuck in a gift card. 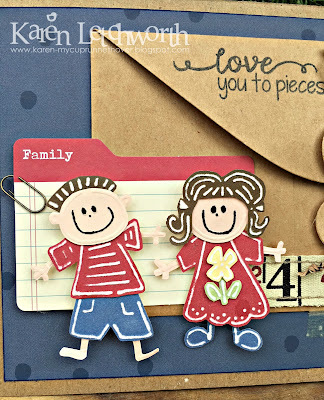 Simon Says Stamp Wednesday Challenge Blog - Simon Says "Back to School" - As detailed above, this card was created for my niece, Brittany, who is a middle school Special Education Teacher. Mod Squad Challenge Blog - Back To School - My back-to-school story is shared in detail above. I had a lot of fun creating it! 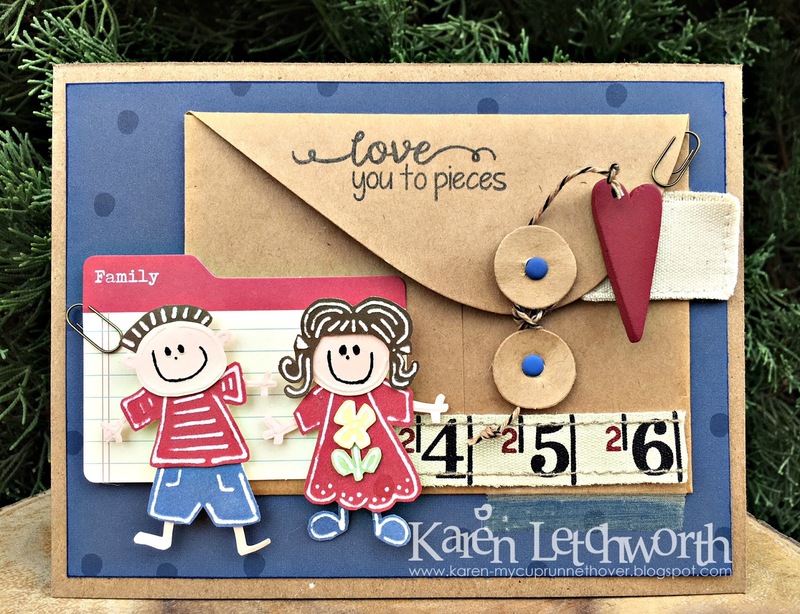 Aud Sentiments Challenge Blog - Challenge #210 - Anything Goes With Sentiment - I stamped my sentiment (Love You To Pieces). 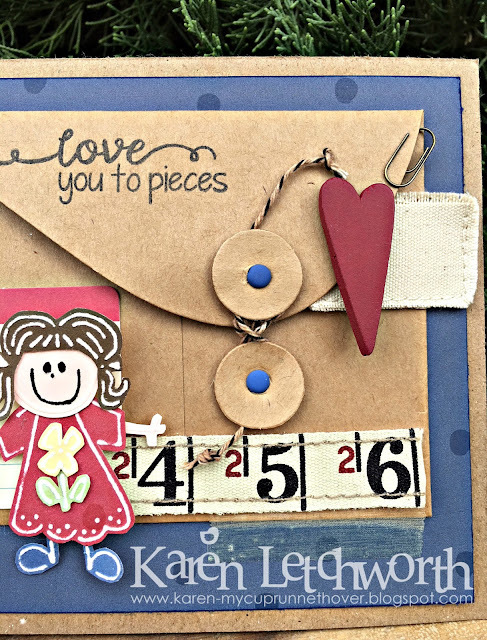 CropStop Challenge Blog - August Linky Part #42 - Anything Goes - I used lots of Tim Holtz products including the ruler ribbon, rusty paper clips and Distress Inks. What a beautiful and thoughtful card for your niece Karen - I am sure it will be appreciated and bring comfort to Brittany. A difficult time for her, especially just as school is starting again. What a sweet card for your niece! I'm sure it will cheer her up to know you thought of her and cared enough to send a card! So very happy you linked this up to the Cropstop blog this month! 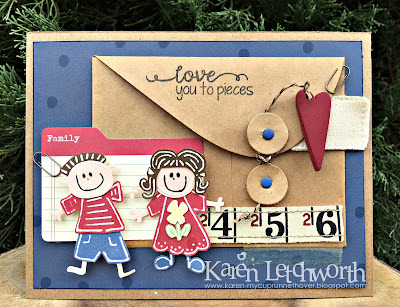 I just completed a journal using the same type of closure that is on your envelope = this is surely a lovely layout! Great work Karen! AWE! This is so sweet! I love the little kids and the ruler looks awesome! Thank you so much for joining us at Simon Says Stamp Wednesday Challenge. Good Luck!